But I’ll tell you. 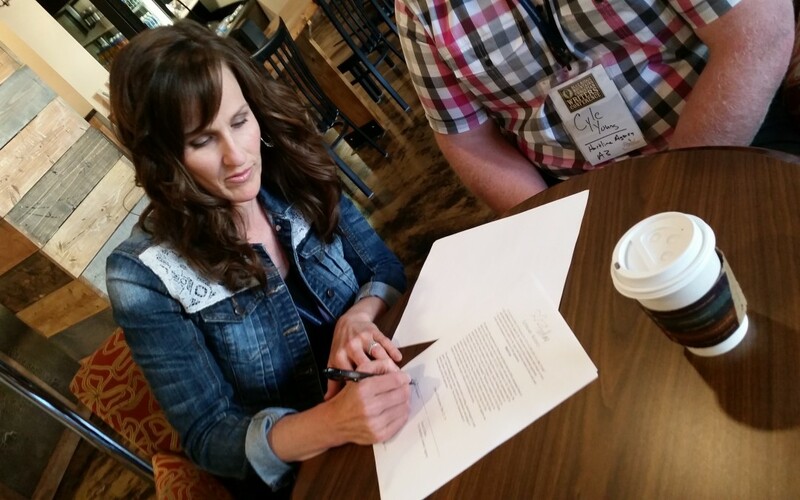 Two years ago I went to the Blue Ridge Mountain Christian Writer’s Conference in Asheville, North Carolina with ridiculous hopes. Not only did I rehearse in my mind, over and over again, my acceptance of the top prize in the children’s book contest I entered, but I fantasized about how agents would be scratching and clawing at each other, fighting for the privilege of representing my work. And then I’d rehearse the sequel to that fantasy. After that lucky agent had pitched my manuscripts to a giant publisher, I could picture that publishing executive standing speechless, tears of gratitude welling as he gazed upon a piece of children’s literature that publishers only dream of discovering. True story. while heart longings that come to fruition refresh them. Coming home from that conference sobered and wiser, I set to work on doing my homework and producing work that was more marketable while still expressing the messages I was passionate about. I’m delighted to say that this past week’s writer’s conference revived my spirit. God graciously provided a literary agent who was willing to represent my work. (And sadly, no. He didn’t have to scratch and claw to do so, but I’m thankful nonetheless.) I don’t know what my agent thinks of this analogy, but I likened the peace of having an agent to the soothing sounds of a dishwasher – it puts a smile on my face to know that work is being done for me that I’m not doing. I did promise you an update from the conference and I’m thankful to report this to you. But it’s not enough to leave it here. Though I hope a publishing contract will be the final result of this journey, and I’m now a giant step closer, I don’t know if that hope will come to fruition. And that will be okay. If we place our hopes in this life on the varied and uncertain dreams we hold, we risk living much of life heart-sick and disappointed. Though I do have hopes for this area of my life, they are not my big life hopes. Not even close. I’ve come to see that one of the smartest things I can do in life is hope with intelligence in things that are certain. When I do, I get to live life with most of my desires fulfilled. Not a bad plan. I hope that God never loses sight of me. And He doesn’t. I hope that even difficult things in my life can ultimately be used for good. And they are. I hope that God sees and counts as my expression of gratitude, all my little acts of obedience and daily acts of service I render to Him and the people He’s given me. I hope that I can be more beautiful as the years pass, even if I don’t look more beautiful. And I can. I hope I will become more and more like Jesus in how I think, act, speak and love. I hope there’s only one assessment of my life that matters. And it does. I hope God will cancel the sin debt against me since I’m claiming Jesus’ payment as being credited to my account. Logical Hopes = Happy Hearts. After coming home from a writer’s conference, I suppose it is fitting to end with a story. And so I will. When my girls were tiny, there was in our church, the wonderful Miss Amy. Your church is blessed if you’ve got one. You know, that vibrant young woman in the season of life before any potential marriage when she is free to be present, and dote on everyone else’s kids? And dote she did. Not only did the girls get hugs and treats from Miss Amy when we visited her office. But on each of the many occasions when Miss Amy would come to our house, she would consistently deliver marvelous treasures. Smart girl. How clever she was to hope in what was certain, because wouldn’t you know it, she was not disappointed that day. Janet, you deserve all the awards in my opinion, and I’m not just saying that because you’re my friend. You give such wisdom in your writing, and I’ve seen that you live it. I do hope your books are published, not only for your sake but for the sake of all those out there who will benefit by them. So exciting friend! God has gifted you with such wisdom and I’m so glad he is giving you a way to share that with this world! Hopin’ right along with you that He will continue to bless your ministry!!! Thanks sweet and steady friend! Missing my church family lovelies and looking forward to Sunday!